Island food has usually always meant you will be eating fish, but on Fuerteventura this is not the only thing available. Cabra, or goat, is one of the main foods here on the island that is one of the original dishes served for many years. It is common to have goat either roasted or stewed and severed with canary potatoes or wrinkled potatoes as this is how they look when they are finished cooking, with Mojo picón. Goat has a similar taste and texture to beef however it has a little extra fat that helps to keep it tasty and moist when cooking. Canary potatoes are small boiled potatoes slathered with salt and served with mojo picón. There are two types of mojo picón on the island. You have mojo rojo which is a red sauce made from garlic oil cumin and chili (or roasted peppers) and is a great addition to meat and vegetables. The other type is mojo verde (green) which is made from garlic oil and cilantro or coriander. Mojo verde is milder than the other and is liked by people that don´t have the Teflon mouth that many of us do. If you have ever had a great spicy curry, you will love mojo picón(rojo/red). There are different recipes for each and in each household there are different ways to make this delicious sauce. There is also a variation of the red sauce that has almonds and is also considered mojo amarillo (yellow) but it is only in certain parts of the island. There are many types of fish covering the island coast but one of the most famous is Vieja(parrot fish). A typical dish on the island is Vieja spiced with citrus cooked in the oven and served with potatoes and mojo. It is very common to find goat as a main dish as well. Served much like normal stew, goat is served in a bowl but with veggies on the side and also normally with potatoes and mojo. The preparation of this meal is also a little different. Often the bones are left in for the flavor and you may find a few renegade bones hidden away in your food. It is not uncommon to find that the bones have been somewhat crushed in the meat as well and sometimes that might be a putoff, but the flavor doesn´t change whatsoever. There are many types of cheese on the island and a few are a direct recipe of the Majorero (the native people from Fuerteventura) who used goat for everything, from clothing to it´s meat and cheese. Goat cheese has very strong flavor and has been used with everything from salad to sandwiches. It is common to find 100% goats cheese on the island, but there also types that have at least 15-20% sheep´s milk used in the preparation. There are different grades of cheese and they are graded by how much or little goats milk is contained within. The queso fresco (fresh white cheese) which is very soft is primarily made with cows milk, can also be found with goats milk. There is also a type of grain that is used in canary kitchens called gofio. This grain is an acquired taste and should be 'tried not buyed'. Often used as a thickener for gravies and soups, is also used in the preparation of some goat dishes but used often with milk to make a porridge type of breakfast cereal. This toasted grain, made from wheat and maize and even barley, has been used for years and was very important in times of famine or the poor times during the Spanish civil war, and was used with sugar and water to make a dough-like paste that could be eaten directly or cooked in multiple ways. Some kids still eat gofio straight from the bag but it is an acquired taste and should be tested from a kitchen that know what they are doing. 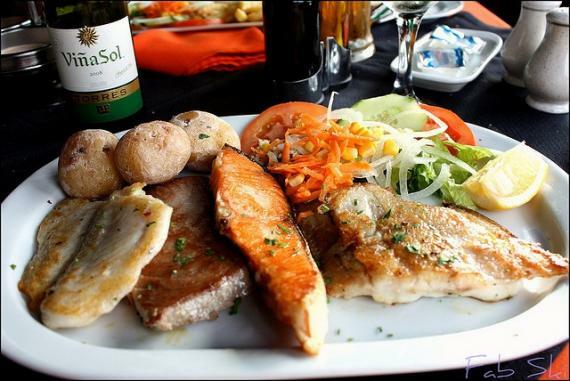 You are sure to fill your tummies with a great selection of typical Fuerteventura dishes.